The BELA edition P69 convinces with a slightly different design. From the outside a rounder shape and from the inside with high gloss. 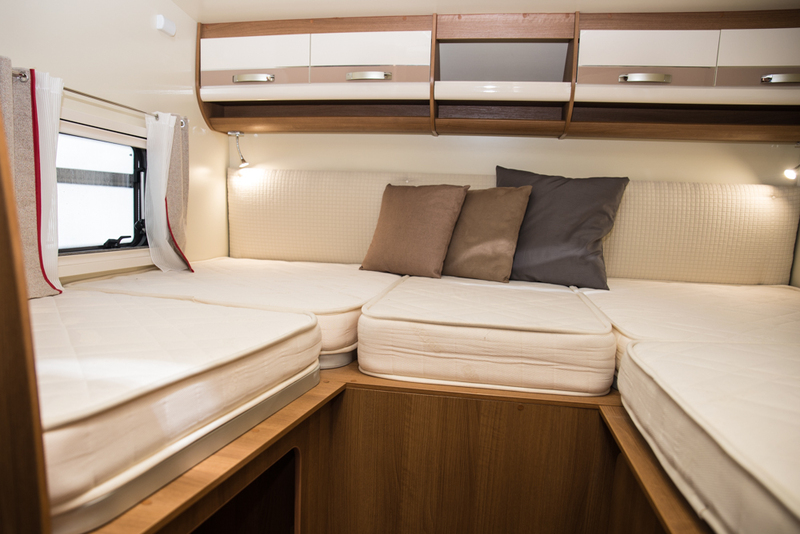 The under-7 m partly integrated mobile home with single beds is intended for vacation trips up to 5 persons. You have sleeping possibilities in the rear, in the single beds, which you can convert also to a large couch (for 3 persons). In the dinette you can fold the table downwards and create a complete lying area (for 1 person). Optionally, we can integrate an electric lifting bed (for 1 person or 2 children) for you. A modification is not needful here, one button and another bed is available. In the partially integrated single beds mobile home you have 2 easily accessible wardrobes, drawers and many storage room for your clothes as well as for all things you want to take with you. In the large rear garage not only camping articles slot in, also 2 bicycles or a scooter. The spacious kitchen with large refrigerator has yet another work table. The mobile home has a separate shower and toilet with a dividing wall.